I’ve been pondering why I’m drawn to the subject matter I am and why it even means anything to me at all. This is a bit of a self-indulgent post but it’s interesting to me to have a look at my family and the influence that ancestry can have on the present. Hopefully it’s interesting to you readers from a voyeuristic point of view too! 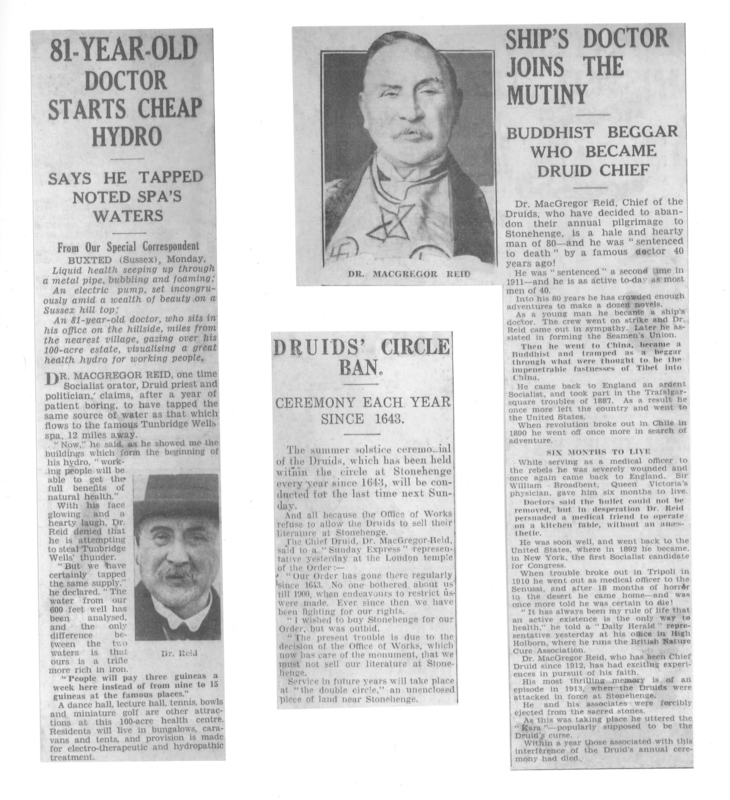 So, here is my great grandfather, George Watson MacGregor-Reid, Chief of the Druids, Labour Party candidate ,hydro owner, publisher and all round storyteller (he never let the truth get in the way of a good story, which is a kind way of saying he was a bit of a liar.). Back in those days I think he would be referred to as “eccentric”. He’s the one in the back there with the funny hat. 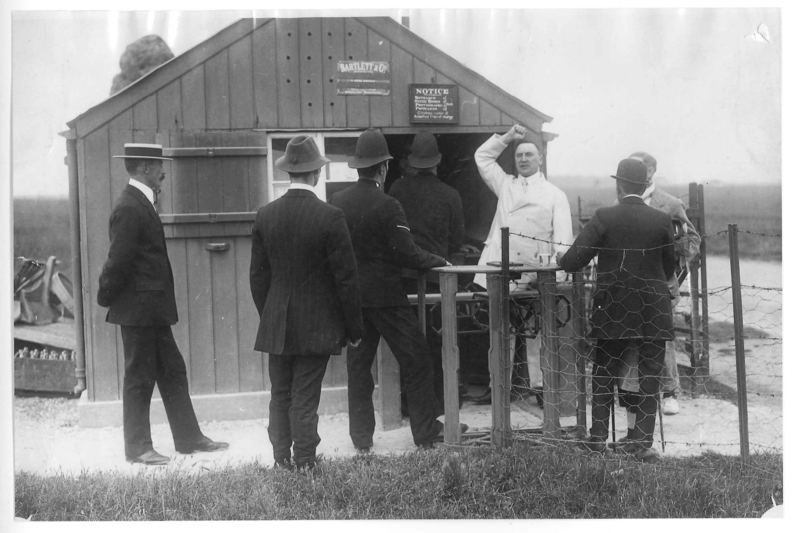 Here he is shaking his fist at the police for not allowing him entry to stonehenge. This was a huge bugbear for him! He felt that archeological monuments of significance should be available to all british citizens and should not be controlled by private ownership. And here are a selection of articles about him. Most of it is probably not true. Despite his loose relationship with the truth, by all accounts he was a very passionate, generous and charismatic man. He was a fierce advocate for social justice and liberty, and explored eastern mysticism as well as western esoterica helming the Order of Druids for many years and having correspondence with Aleister Crowley and other british occultists at the time (he advertised Crowley’s Equinox journals in his own publications). My grandfather, Robert Arbuthnot MacGregor-Reid was elected to the role of Chief Druid after GW and continued his legacy. 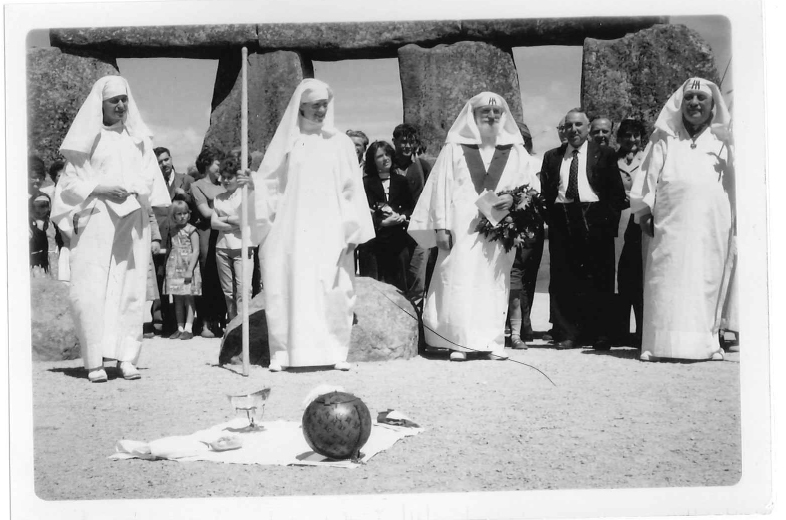 Here he is at stonehenge (far right). He was also involved with the labour party and was a less eccentric and apparently very kind and gentle character who would hold coffee groups to debate intellectual matters in Clapham. 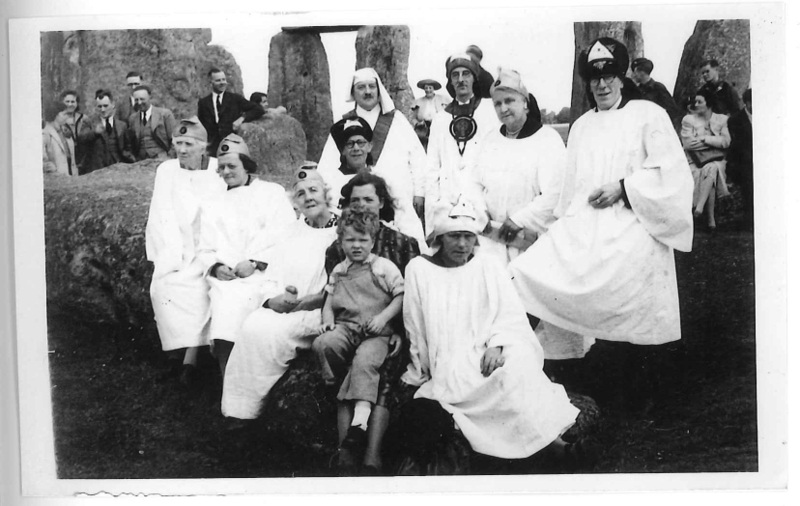 In the photo below you can see a younger, slimmer version of Robert at the back with my grandmother, Bridget, in the front holding my dad, George, on her knee surrounded by the druid order at stonehenge. My dad didn’t have the same interests as his predecessors and took a much more ‘normal’ career as an academic, but I do think he had a fair bit of their personality in him. When I was a child he would take me wandering around the countryside in the north of England to look at archaeological sites and standing stone monuments. He made up a lot of stories for me about the dragons and fairies that lived on the crag behind our house, and we would often go and look for them. I was particularly interested in fossils, so fossil-hunting trips with my dad were a real highlight. I also had a small book of british fungus and we would go though the woods in the autumn looking for toadstools so I could tick them off my list of “to sees” – I was so disappointed that there were some really exciting specimens we could never find! My dad didn’t tell me about my relatives at all and by the time I was born my grandfather was dead. I think maybe he was a little embarrassed by them and their eccentricities, I was never able to really ask him. I always got the impression that by the time I was in my early teens and there were stacks of books on neolithic monuments, occultism and mythology stacked up on my bedside table he just sort of gave in, realising that through whatever weird genetic lottery I had inherited the family interests. Let’s face it, it could be a lot worse; feeling that care for the environment and respect for personal liberty is important is actually fairly forward thinking. Wandering around stonehenge in a white robe is just a bonus! I think he was 🙂 I wish I could have met him! It’s been very hard to find out accurate information about him. There are a couple of academics who are researching him and I’ve been trying to help them out but it’s very tricky due to all the conflicting information. Magnificent post Mare! You definitely are drawn from the same genetic stuff. Absolutely wonderful post. You’re most fortunate to have such a heritage indeed. merry meet and bright blessings. Jamie Reid is the head druid’s grandson. 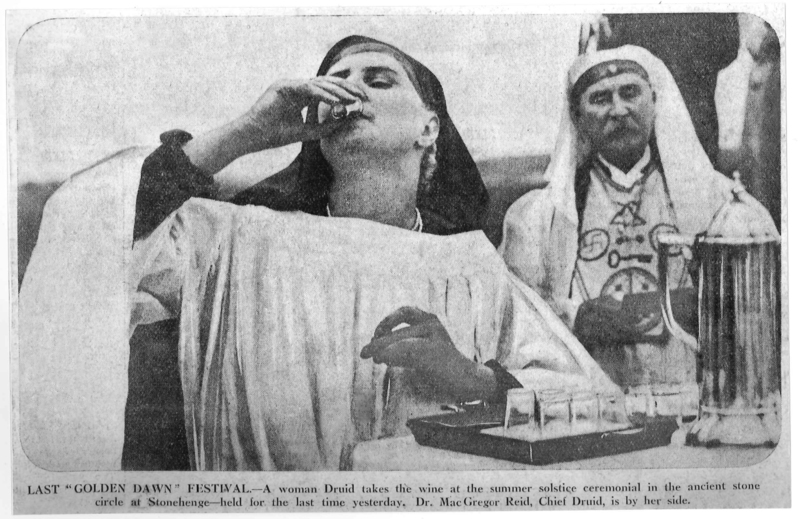 We have 2 Chief Druids in the family; my Grandfather and my Great Grandfather. My Great Grandfather is Jamie’s Great Uncle. Actually Jamie has a big show on in Hull right now if you’re in the UK. Unfortunately I’m on the other side of the world as I’d love to go. I’m currently compiling a book about George Watson MacGregor-Reid but its very difficult as he was such an eccentric and it’s so hard to know what is real and what is fiction! Just for accuracy, he’s not Jamie’s grandfather, he’s his Great Uncle. George Watson was from a working class Scottish family so he certainly didn’t come with much privilege, but definitely with a whole barrel of activism. My family are pretty fascinating!